Will oil prices going to continue to decline or is yesterday's correction the end of the recent sell-off? Are we in the early stages of a 2008-like price collapse or just a minor correction in a semi-bull market? We certainly don't claim to be have the ability to such questions as it would require us to know know what the global economy and central bankers are going to do in the coming months, both impossible tasks to say the least. Nevertheless, given the sharp declines in global oil and refined product prices last week, now is as good a time as ever to stress test your hedge portfolio to determine how a large price move (not only a lower but higher as well) would impact not only your positions themselves but your cash flow, credit lines, etc. After peaking early last week, Brent crude oil, WTI crude oil, gasoil, ultra low sulfur diesel and gasoline futures declined by an average of 4.4% by the close of trading on Friday. 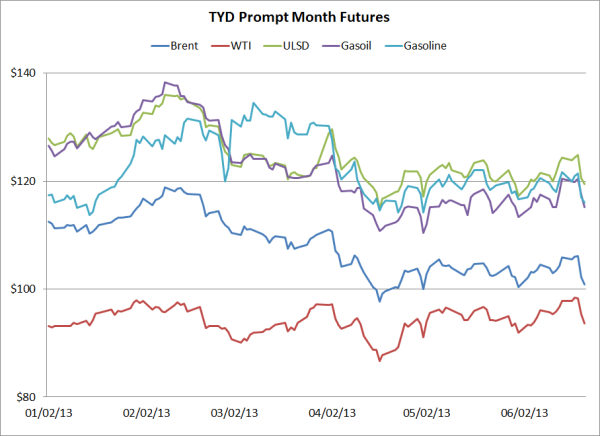 In addition, Brent, gasoil, ULSD and gasoil futures are all trading well below the levels at which they began 2013. So what caused prices to decline last week? A fragile, global economy which heard Federal Reserve Chairman Ben Bernanke lay out a potential road map for reducing and perhaps even ending the Fed's bond-buying program, which caused nearly all asset classes to sell off. 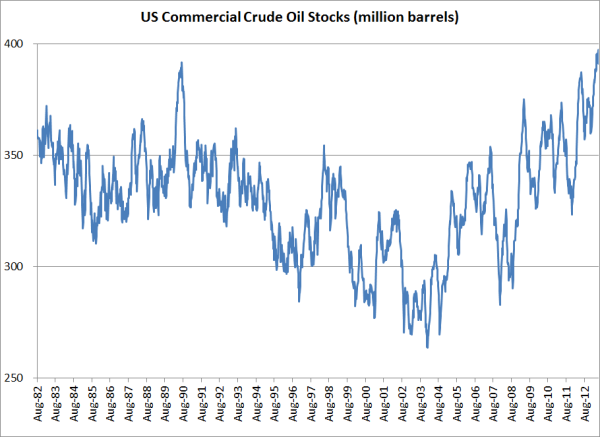 In addition, US crude oil stocks are near an all time high at 393.121MM BBLS while the demand side of the equation is lukewarm, as both gasoline and distillate demand are down just shy of 1 millions barrels per day vs. their per-crisis peaks. So where do we go from here? It's anyone's guess as there continue to be numerous variables that make a strong case for lower prices as well as several that can make a case for flat or higher prices. On one hand, high crude oil stocks and relatively low demand (very low demand in some areas of the world where economic conditions remain weak) all point to lower oil and refined product prices. On the other hand, ever present geopolitical tensions combined with infrastructure issues such as the closure of crude pipelines in Alberta tend to keep prices relatively high. Can your hedging strategies, as well as your cash flow, credit lines, etc. sustain a repeat of another 2008-like crisis? Can your hedging strategies as well as your cash flow, credit lines, etc. sustain a repeat of another price spike towards $150 per barrel? How can you know? It's really quite simple, run stress tests on your hedge portfolio to determine how it would perform in both a $50 and $150 price environment. Ideally said stress tests would include numerous price points above, below and in between $50 and $150 as well. While best practices dictate that such stress tests should be conducted on a regular basis (i.e. monthly) our experience shows that many companies rarely conduct such analysis. In addition, we would argue that other related, relevant metrics should be stress tested as well. What do we mean by this? Take a trucking company who "passes on" most of their fuel price risk to their customers via a fuel surcharge. In theory such a surcharge combined with what is thought to be a conservative fuel hedging strategy such as a costless collar should put the company in a good position, regardless of whether fuel prices decrease, increase or remain near their current levels. In practice, many companies who utilize both fuel surcharges and hedge their residual (in this case we are referring to residual fuel price risk as fuel price risk that is not captured via the fuel surcharge formula) fuel price risk can find themselves in a position where their fuel surcharges and hedges aren't as well aligned with their actual fuel costs as they anticipated, which can lead to cash flow issues. Building on this example, let's assume that crude oil prices, and subsequently diesel fuel prices, decline rapidly towards $50/BBL. If, as mentioned earlier, the company had hedged their residual fuel price risk with a costless collar, they would likely face a cash flow issue due to the short put position of the costless collar will result in mark-to-market losses (and in turn, margin calls or inadequate credit lines) that occur before they realize the benefit of lower fuel prices. Likewise, similar examples can be made for nearly every company with significant energy price risk, which is why we say that your stress tests should not be limited to your hedges but to your business as a whole. Consider the case of an airline who aggressively hedges their fuel price risk with fixed price swaps or costless collars. In theory any hedging losses from the swaps or costless collars should be offset by lower physical fuel costs, but what happens to said airline when faced with lower demand from their customers, as was the case during the financial crisis? They could very well find themselves in a situation whereby their fuel consumption declines to such an extent that they have hedged more fuel than they are consuming, which leads to hedging losses which are not fully offset by lower fuel costs. As a result, their net profit margins are declining at the same time the demand from their customers is declining, a double-edged sword. While this might appear to be an extreme example, many airlines found themselves in this exact situation following the financial crisis. In closing, most, if not all, companies will be very well served to take a closer look at their hedging strategies to determine how said strategies will perform in both significantly lower and higher price environments. While neither extreme price environment may become a reality anytime soon, it's never to early to know how your hedging strategies will perform in such an environment. Last but not least, if you haven't done so recently, now would be a good time to review your hedging policy and procedures as well.